In 1991 Gerald Ratner achieved notoriety in the UK after making a speech in which he jokingly denigrated two of the jewellery products sold by his company. The so-called Ratner Effect caused the company’s near collapse. In 2017 the USA the hashtag #DeleteUber started trending in January and so far it’s been annus horribilis for Travis Kalanick, Uber’s CEO. Although Kalanick stepped down from Trump’s advisory council, prompting another mea culpa, the embattled ride-hailing company is still surrounded by controversy. According to TXN Solutions, which tracks debit and credit spending, Uber’s troubles have resulted in market share gains for Lyft, its main competitor. Uber spend across the US has declined since January by 2% while Lyft has jumped 30% on average. In Uber’s home city, San Francisco, spend was down 8% while Lyft jumped 24%. For IHRSA attendees in Los Angeles the ride-hailing service Lyft became the de facto service and for those with ApplePay, a Lyft (get it?) was just a finger touch away; how simple and intuitive. Lyft’s use of the latest technology provides a seamless digital gateway of choice and many lessons for the fitness industry. Consumers are in control and brands need to stop interrupting with bad technology and attempts to sell unwanted products or services. Instead they need to have smart conversations and start listening. Lyft has that conversation and is listening after every ride: if it wasn’t perfect, how could it have been better? When did you receive a request to rate your leisure experience: your instructor, the class, the PT, even the club. For me? Never. Those fitness brands that offer transparency of pricing are growing faster than ever and the same brands are open about the good, and maybe the not so good, conversations they are having with their customers but they listen and respond. Peer reviews of the workout, instructors and the all-important experience keeps everyone on their toes. At the networking roundtable chaired by Bryan O’Rourke operators degraded the heritage CRM [customer relationship management] systems that the industry is suffering under. So will traditional CRM systems be dead in five years time? Probably. Some heavy competition is being tested in California. Reserve with Google gives deeper booking integration so a local search, which relies on live timetable APIs [application programming interface], becomes more transactional. Previously booking buttons would link away to a third-party provider but now it is deeply integrated. Mindbody, Full Slate, Front Desk, Appointy are all currently live on Reserve with Google and ZingFit, MyTime and Genbook are coming soon. Only Mindbody were demonstrating this integration at IHRSA but hopefully all will be there next year in San Diego. More competition is coming from Facebook, which has recently added local reservations and integrated bookings. Its Events calendar has been turned into a stand-alone app, allowing groups of friends to book and buy activities together. 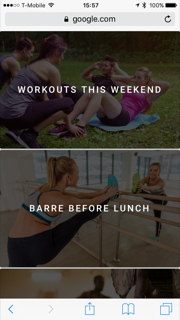 Airbnb are linking the consumer to a world of fitness experiences which taps Airbnb’s community to offer highly curated opportunities. Even Yelp is accelerating adoption of local listings to include payments and bookings. It won’t be long before Amazon make an announcement in this area, linked to Alexa searches. All these companies, plus Apple, have fitness teams analysing the industry and how they can disrupt it, search and bookings is an obvious one. 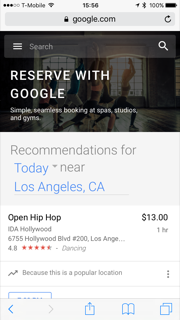 Reserve with Google was live in LA so IHRSA delegates could logon to experience the granular search, from APIs of live timetables, linked to seamless integrated booking. Reserve puts the consumer at the centre of the search and, with artificial intelligence constantly learning what type of class or activity you like, it will deliver your personalised push notifications that address the question of which class, where and what time before you’ve thought of it. Those poised to take advantage of this new era are the boutiques, fitness without boundaries, community activities and meet-ups. In the UK public sector sites and trusts have been early adopters of live timetables and APIs, concretely demonstrating the value of digital. For those of you who are still using pdf and, heaven forbid, a pdf on an app, then help is at hand. AiT (Active in Time) a UK start-up company provide the free software and for a small monthly charge APIs for those who want to be part of the digital revolution. Over 500 sites in the UK and Ireland are now live and pushing digital innovation. AiT offers to integrate your live timetables into these new search and booking services as they become available in the UK. IHRSA is known for its roundtables and keynotes. Soraya Darabi, a young global leader of World Economic Forum, said we can’t create emotional attachment if we stand for nothing. So Lyft drivers stand for great service, good value and working for a company they admire. From Soraya’s experience at her local gym in Brooklyn, she wonders if the fitness industry, which has the potential, will ever develop the same emotional attachment. Martin Lindstrom, a brand futurist, suggested “living with the client” or listening to the consumer; how many fitness sites have anything more than a feedback form? Lindstrom used the supermarket Lowes to show how it was “small data, not big data” that helped turn around a failing brand. Lowes relaunch has some fun elements but Jonny Earle, alias Jonny Cupcakes, was off the wall. He created a brand and inspired customer loyalty from shops that don’t sell cupcakes but T-shirts. My favourite was the breakfast T-shirt which you could only buy between 7-11am. The 21st annual IHRSA financial panel, moderated by Rick Caro, emphasised that detailed knowledge of the industry is limited even when big investments are being made. l hope Rick will come to London in October for IHRSA Europe and put a panel of UK investors together who have access to the most detailed data on the industry thanks to LeisureDB. We will be presenting the LeisureDB data analysis platform and the historical trends from its annual State of the UK Fitness Industry Report and live monitoring of the industry from its Social Media Fitness Index. Historically prospectors in the Californian gold rush needed a shovel and a sieve. Now influencers do the spade work for you. ‘Cycologists’ create 45-minute experiences you want to pay $30 for and who ignite avid followers. I’m following Shannon at Aura on Third, and Nick at Cycle House on Melrose. Fitness on your phone: who is yet to be connected and how can we get them on board?